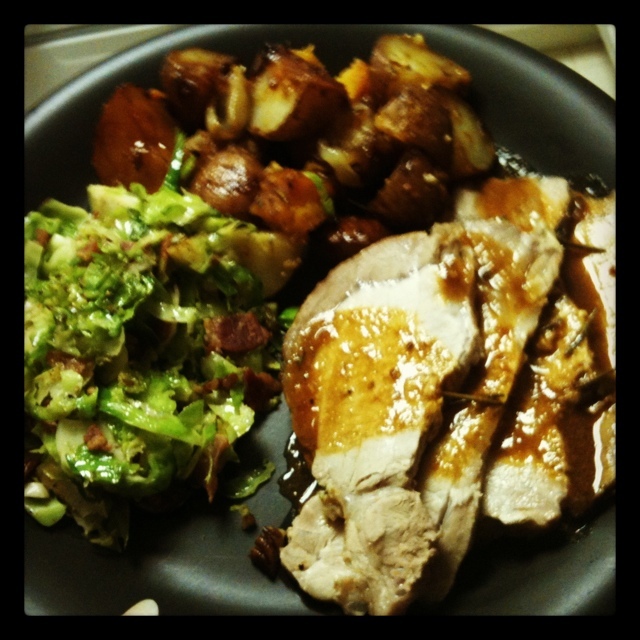 food: maple, mustard & riesling roast pork | eat. drink. fly. last night, i’m not sure how i got so lucky, but i came home to a feast courtesy of my husband. my canadian living cover picture was singing a siren song to him in the form of maple, mustard & riesling pork roast. even the name sounds drool worthy. here was the finished product – served with roast potatoes & butternut squash with my favourite brussels sprouts recipe (with bacon & pecans) on the side. i wish the photo wasn’t blurry, but i was too excited to eat to play photographer. Cut shallots into 1/2-inch (1 cm) thick pieces; place in roasting pan. Top with pork; drizzle with remaining marinade. Roast in 325°F (160°C) oven, basting 2 or 3 times with pan juices, until juices run clear when pork is pierced and just a hint of pink remains inside, or meat thermometer registers 160°F (71°C), about 2 hours. Reserving pan juices, transfer pork and shallots to serving platter; tent with foil and let stand for 10 minutes before slicing pork thinly. Place pan over medium heat; bring juices to boil. Add remaining wine; cook, stirring and scraping up any brown bits on bottom of pan, for 2 minutes. Mix carving juices into pan juices; spoon some over pork slices. Serve remainder on the side. Amazing. As someone who can’t stand cabbage, I give it an *I approve*.